"And so the arts are encroaching upon one another, and from a proper use of this encroachment will rise the art that is truly monumental." • 10:00am Panel: Creative Technologies in Music at the Nexus of Arts, Science, and Entrepreneurship featuring Shiau-uen Ding, Miller Puckette, and David Zicarelli, moderated by Ivica Ico Bukvic. • 11:00am-4:00pm A series of ICAT day events including a presentation of New Musical Interfaces developed by a transdisciplinary group of students participating in the new MUS4014H course. • 6:00pm New Music Blacksburg concert, featuring acoustic chamber music by student composers. 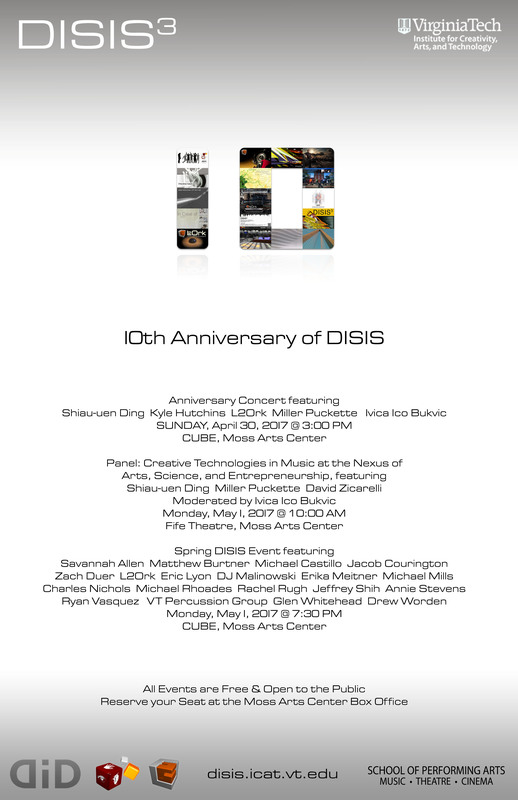 • 7:30pm Spring DISIS Event featuring Savannah Allen, Matthew Burtner, Michael Castillo, Jacob Courington, Zach Duer, L2Ork, Eric Lyon, DJ Malinowski, Erika Meitner, Michael Mills, Charles Nichols, Michael Rhoades, Rachel Rugh, Jeffrey Shih, Annie Stevens, Ryan Vasquez, VT Percussion Group, Glen Whitehead, and Drew Worden. • 9:30am Guest lectures by Miller Puckette and David Zicarelli as part of the MUS4014H class. The event is open to all VT students and faculty. • 2:00pm Lecture and a master class with the pianist Shiau-uen Ding. • 7:30pm Virginia X exchange concert, featuring acoustic and electroacoustic music by student composers from around the state. In celebration of its 10th anniversary nad as part of the ICAT Day, VT Institute for Creativity, Arts and Technology (ICAT) and School of Performing Arts' Digital Interactive Sound and Intermedia Studio (DISIS) presents a series of events of interactive computer music and fixed media, featuring performances by special guests, faculty artists, Virginia Tech ensembles, and students. "Digital iD" events offer an exploration of synergies among music, technology, arts, gesture, collaboration, interactivity, and ultimately community. All events are free and open to the public. For ticketed events you can reserve seats at the Moss Arts Center box office.